A tiny Syrian boy who has known mostly war and suffering in his short life, wants to pay humanitarian volunteers who have brought food to his family. 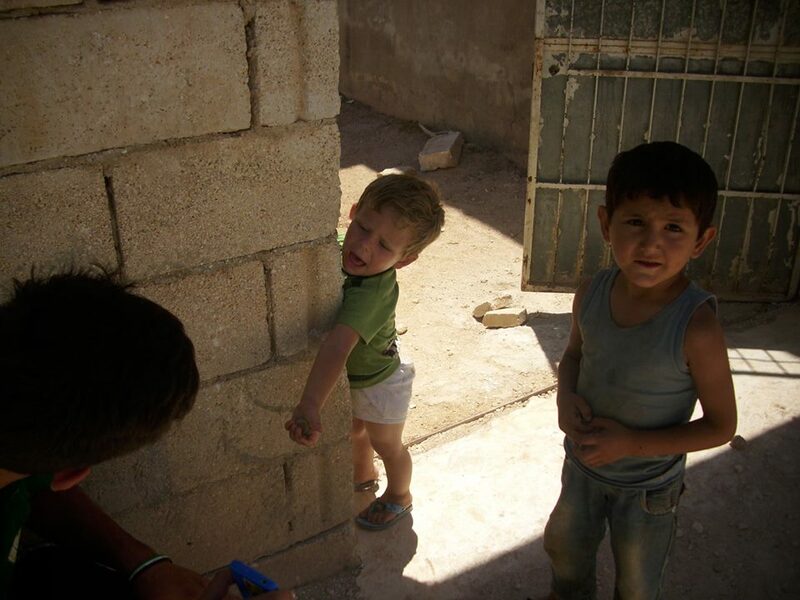 The moment of the distribution of food parcels in a context of war is always a moment of relief for everyone. Aid that arrives in areas that are continuously bombed and under siege, becomes vital for the civilian population. The families are ready to receive the donations, without ever giving up their own dignity and self-respect. No one has chosen to become displaced, no one has chosen to undergo a genocide. They are all victims and to rescue and assist them is an imperative for all of humanity. For children it is a time of celebration: they get to see the vans with people who move from house to house and stop to make deliveries. Those young people, with their serene faces and their smiles, inspire confidence. They are the volunteers of two Italian-Syrian humanitarian associations Onsur, Global Campaign to Support the Syrian people and Ossmei, Syrian Organisation for emergency medical services in Italy. Among them is Abdullah Dachan, a student: he delivers a box to a man who is there with his son; the shy little one peeking from behind a wall. He was blonde, like angels in paintings, he must have been no more than three or four. The volunteer stops in disbelief: how much dignity, how much fairness, how much innocent spontaneity in that little man, who would want to pay for what he has received. Abdullah asks the boy’s father if he can pick him up: he then hugs him, gives him a kiss, holding back the tears … tears of emotion and anger – why, why do these children have to suffer all this – he asks himself. “It is I who have to thank you, little friend. You gave me something beautiful, your smile and your courage,” are the words he would like to say to him. In addition to the residents who are driven to exhaustion by the bombings, there are thousands of displaced people in that area. They have all lost their homes, their jobs, their freedom. Among them there are a few survivors of the massacre of Banyas. Civilians fleeing the horrors of a genocide that does not give signs of abating, while the world remains unmoved. 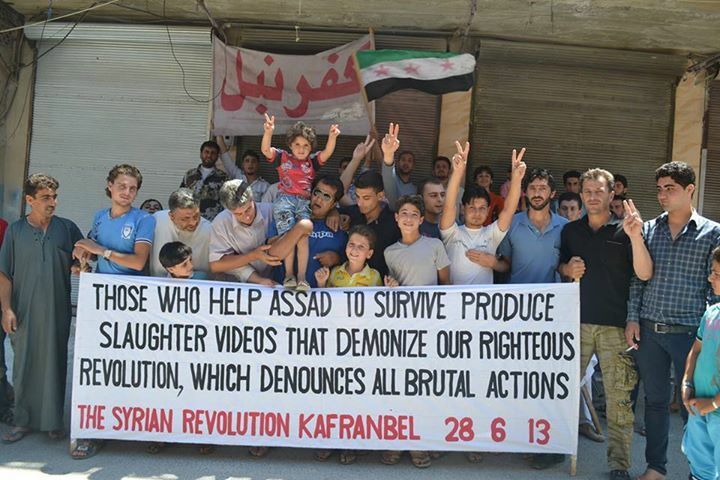 Still from the beheading video… Released by SyriaTruth, a proRegime “information” site, wonder how they got it, don’t you? With a terrifying growl and a nasty sneer the self-styled “judge” of a group of fundamentalist Islamic criminals pronounce the sentence: condemned to death by beheading – indeed, having their throats slit – for having cooperated with the regime. One of the three condemned men, which, as we are shown in the amateur film, is slaughtered by a butcher with a beret like those used in Afghanistan, is according to the caption, Father François Murad, a Franciscan. But his killing, in north-eastern Syria, had been reported three days earlier by another Franciscan, who had said they had recovered the body of Murad but had not reported that the body was headless. This is one of the first and most obvious inconsistencies of a news that has been shrieked by Radio France Internationale and immediately broadcast, in a more or less uncritical manner, by most of the Western media: “Three Franciscans were beheaded in Syria by armed militiamen.” The gruesome video had been released by the network SyriaTruth, which for at least two years has been working as a megaphone in the West to defend the cause of Bashar al Assad’s regime. According to a Syrian source in the region of Idlib, heard by Europa, the three were not priests but instead are “collaborators” of the regime. About an hour after the publication of the video, even the denial of Father Pierbattista Pizzaballa, Franciscan Custodian of the Holy Land arrived: “None of this is true as far as we know. The monks in the region are all alive.” And it is again Pizzaballa on 24 June who did not hesitate to confirm, however, the news of the killing of the ‘”hermit” François Murad in Ghassaniye. This is a place near Jisr ash Shughur, in the north-western region of Idlib and inhabited until 2012 by a Christian majority. About a year ago Ghassaniye was conquered by Syrian insurgent fringes, which were replaced shortly after by militiamen of the Jabhat an Nusra Front, labelled as Al Qaeda – and considered by the U.S. as well as by Assad a “terrorist group” – more and more composed of mujahidin foreigners. By their own admission, the militia of the Nusra Front are fighting for a cause unrelated to that of the rebels and anti-Syrian regime activists: the removal of the regime is only the first step in a much more challenging path towards the creation of a state entity dominated their interpretation of Islamic law. The link between the alleged beheading of the Franciscans and the Nusra Front is immediately established by many media, including Italian ones, based on the caption – where the agency Fides is cites – and on the fact that the crime in the film took place in Ghassaniye. The video shows a group of people, many of them with Central Asian, South-east Asian and North African somatic features, around at least three people kneeling on the ground, blindfolded and with their hands tied behind their backs. One can see two shady characters standing: the Executioner, wearing an Afghan paqul and speaking Arabic with a strong foreign accent (there are those who say he is a Chechen), and the “judge”, an older man who, for all appearances, seems to have just taken part, as the ogre, in the last film in the saga of the Lord of the Rings. In the film there is no reference to the condemned parties as belonging to religious orders or as Christians. Neither does it state that they are executed as unbelievers – kuffar – but because they are “collaborators of the regime.” One of the reasons cited by the Executioner is that “in their mobile phones numbers of officers of the security services (of the regime) of Aleppo were found.” After the chanting of the classic Allahu Akbar (God is great) the execution begins. 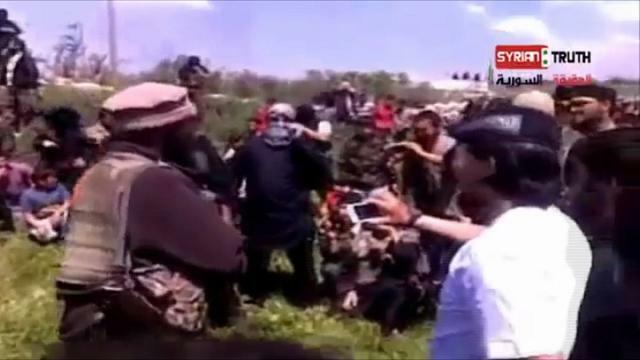 There are many reasons to doubt the authenticity of the caption of the video, where a connection is made between the killing of Father Murad with the beheading of the three individuals who are as yet unidentified. And it is true that the denial of Pizzaballa, in itself, closes the discussion. But there are some confusing elements that recur – and that will continue to recur – in the context of a practice of disinformation aimed particularly at identifying these criminals as the rebels Syrians, with the all too evident aim of pushing the news consumer to conclude that things were better when things were worse. That the regime of Bashar al-Assad, in the end, is the best guarantee for avoiding descent into this hell. For Father Paolo dall’Oglio, a Jesuit who has spent more than thirty years in Syria and who was expelled a year ago by the regime in Damascus, “it is clear that there are criminal groups that operate in Syria and that they are anti-Christian. But remember that these are the same groups that the Syrian regime has previously used in Iraq in a subversive sense.” Father Paolo, however, accuses some Italian and European media platforms for their activities in support of the Assad rhetoric: “There is an objective convergence between the work of disinformation of the regime and the receptors of information of Catholic identity that are always ready to take the bait of the hooks of the regime ,” says the Jesuit, who now lives in northern Iraq. what is in store in the coming hours for Egypt? The protests and subsequent actions were largely instigated by a protest movement called ‘Tamarrud’ (rebel), founded in April by disillusioned Egyptians seeking Mursi’s ouster. It claims to have gathered twenty-two million signatures calling for Mursi to be replaced by its constitutional court president Adli Mansour. Initially, Tamarrud was ignored by Egypt’s main opposition groups. However, as the campaign grew in strength, political opposition figures began aligning with the campaign, and organising meetings to chart a postMorsi transition. Even Mubarak supporter Ahmed Shafiq signed the petition. Opposition leader Hamdeen Sabahi publicly said that if Mursi refused to resign, the military should oust him. Mursi’s Freedom and Justice Party (FJP) and its supporters launched a counter campaign called ‘Tagarrud’ (impartiality), emphasising that the president was democratically elected, arguing that he be allowed time to implement his policies, and that remnants from the Mubarak era were involved in Tamarrud. These events are a symptom of the existing and increasing political polarisation Egypt is experiencing, pitting ‘secularists’ against ‘Islamists’. To this end, the Mubarak-supporting judiciary has been utilised for political goals, and both sides have made charges against the other of ‘secularisation’ and ‘brotherhoodification’ respectively. This has filtered to the population, and has seen the hardening of these stances, increasing the chances of large scale violence. 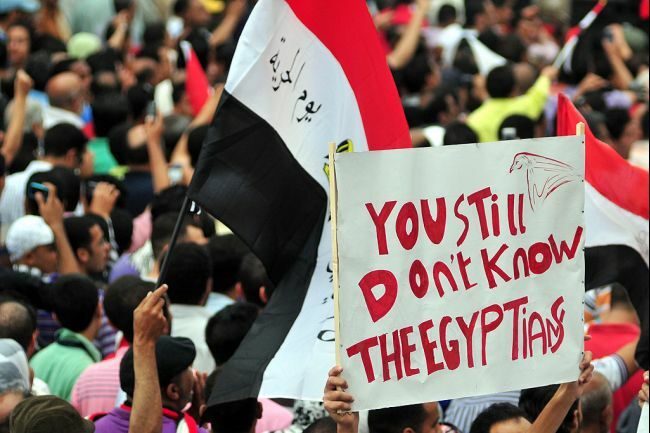 The culmination was the massive (still continuing) 30 June anti- and proMursi protests, which brought the country to a halt. FJP offices have been burned down – an indication of Mursi’s tenuous control over the interior ministry; around twenty people have been killed and over 700 injured, and the prime minister and ministers of foreign affairs, communication, legal affairs, water utilities and tourism have resigned. Tamarrud’s appeal is largely a result of two factors. First, its call for Mursi’s resignation has meant that disparate opposition figures have coalesced around the campaign, using it to regain ground lost over the past five electoral and voting processes which saw the FJP and other Islamists win a referendum; capture over seventy per cent of parliamentary seats; Mursi elected president; and winning a referendum to pass the new constitution with over sixty per cent of the votes. Second, the postMubarak Egyptian economy has weakened as a result of Mubarak’s ouster and lack of investor confidence. Tourism has decreased, the Egyptian pound has depreciated against the dollar, and the country’s foreign reserves have dropped by over half. This has meant that the Mursi administration has had to fight off ‘bread protests’, ensure wheat security, and sustain fuel purchases and subsidies. It has failed at the last, leading to fuel shortages and a virtual economic standstill. This has caused many in the ‘middle class’ to resent the administration, believing that its ousting will miraculously alleviate the problems. The big questions are: what will the military announce this afternoon, and what scenarios are possible thereafter. The army may force the administration and opposition into negotiations, but this now seems unlikely. It is more likely that the army brass will suspend the constitution, parliament and the president – effectively engineering a coup – and setting up a new leadership council to which a new prime minister – likely to be army head Abdel-Fattah Sisi – will report. Is it an accident that this ‘roadmap’ and the proposals of the new 30 June Front, led by Mohammed Elbaradei, are similar? This will result in fierce opposition from various Islamist groups and could result in violent clashes, possibly paving the way for a full military take over. A civil war, as suggested by many commentators, is, however, unlikely. Already the High Command has asserted that it will protect the country from ‘terrorists, radicals…and fools’ – words that echo many of Husni Mubarak’s previous speeches.